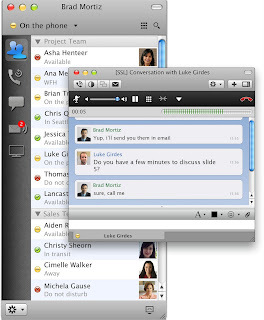 Cisco has released the first Jabber client for Mac OS X. The Jabber client supports both cloud based (WebEx Connect) and on-premise (CUPS) instant messaging and collaborative technologies. Cisco has made available or will subsequently make available the Jabber client for Apple iOS, Blackberry, Windows Mobile, Android, and Windows. As a WebEx Connect customer, we’re excited to have the first support client for the Mac operating system.